The PCB Editor - General page of the Preferences dialog. 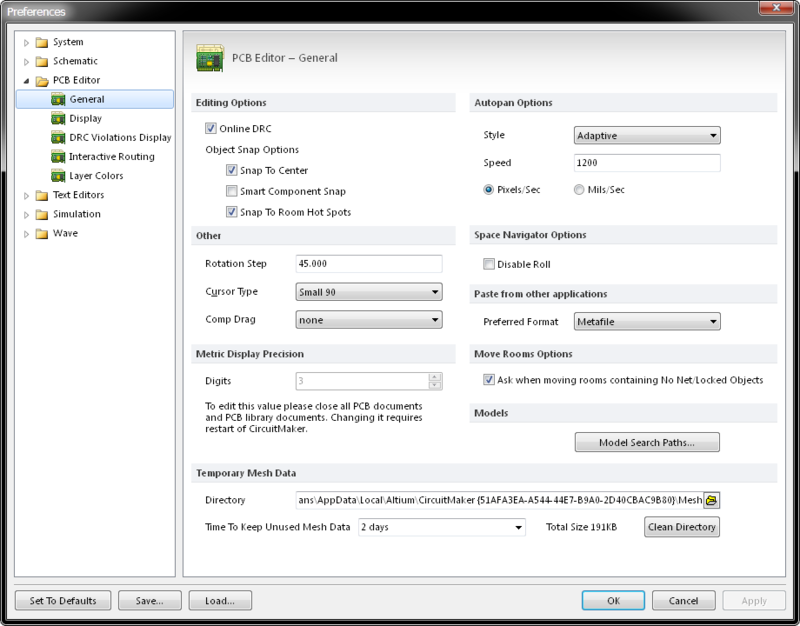 The PCB Editor – General page of the Preferences dialog provides a range of configuration controls relating to the PCB Editor within the PCB workspace. The PCB Editor – General page is part of the main Preferences dialog (File | ) and is accessed by clicking the General entry under the PCB Editor folder, in the left hand pane of the dialog. Online DRC - Enable to have software monitor all PCB design rules interactively (online) as you work and immediately highlight any rule violations. If this option is disabled, design rule violations will not be highlighted as you work. Violations will only be highlighted when you manually run a Design Rule Check. Snap To Center - Enable to have the cursor jump automatically to a defined reference point on an object when it is selected, and be 'held' by that point as it is repositioned. When moving a free pad or via, the cursor will snap to the center of the object. When moving a component, the cursor snaps to the component's reference point. When moving a track segment, the cursor snaps to the vertex point. If this option is disabled, objects will be 'held' by the point where they have been selected. Because the snap grid acts on the cursor position, enabling this option will ensure that an object can be easily positioned where the critical points (such as the pads of a component) are aligned on grid. Smart Component Snap - If enabled, when a component is clicked to select it, the cross hair cursor appears on the nearest pad of this component in respect to the cursor location. Disable this option so that the cross hair cursor always appears on the component's pad reference point when it is clicked on. A pad designated as the reference point usually is the first designator (1) of a component. Snap To Room Hot Spots - Enable to have the cursor jump to the room hot spots. Re-Center - Re-centers the display around the location where the cursor touched the edge of the main design window. It also holds the cursor position relative to its location on the board, bringing it back to the center of the display. Fixed Size Jump - Pans across in steps defined by the Step Size value. Hold the Shift key to pan in steps defined by the Shift Step value. Shift Accelerate - Pans across in steps defined by the Step Size value. Hold the Shift key to accelerate the panning up to the maximum step size, defined by the Shift Step value. Shift Decelerate - Pans across in steps defined by the Shift Step value. Hold the Shift key to decelerate the panning down to the minimum step size, defined by the Step Size value. Ballistic - The panning will increase from the Step Size value to Shift Step value dependent on how far past the edge of the viewing window you move the cursor. Hold the Shift key to pan in steps defined by the Shift Step value. Adaptive - (Default) The panning will move at a constant speed when the cursor reaches the edge of the PCB window. When there are no design objects in the region where the panning is taking place then the cursor speed slows down. Speed - Shows the current autopanning speed. Edit this field to change the speed. The measurement is set according to the Pixels/Sec or Mils/Sec options. Mils/Sec - Select this option to set autopanning in mils per second. The number of mils per second is set in the Speed field. Pixels/Sec - Select this option to set autopanning speed in pixels per second. The number of pixels per second is set in the Speed field. Disable Roll - Check this option to disable the Space Navigator function. Rotation Step - Shows the amount of rotation, in degrees, applied to objects floating on the cursor when the Spacebar is pressed. Edit this field to change the angle (default is 90°). Minimum angular resolution is 0.001°. Pressing the Spacebar when an object is floating on the cursor rotates the object by the set number of degrees in an anti-clockwise direction. Hold the Shift key while pressing the Spacebar to rotate in a clockwise direction. Small 90 - Small crosshair cursor angled at 90° (eg. +). This is the default. Large 90 - Cursor consists of intersecting horizontal and vertical lines spanning the width of the screen. Small 45 - Same as Small 90 except that the cross-hair lines are at a 45° (eg. X). None - Only the component moves when it is dragged. Any attached tracks will be disconnected and left in place. Connected Tracks - Any connected tracks will remain attached to the component when it is dragged. Metafile - Processes Windows enhanced metafile data, however, if there is no enhanced metafile content, any Unicode text data will be processed. Text - Processes Unicode text data and discards any enhanced metafile data, however, if there is no Unicode text content, any enhanced metafile data will be processed. "5.25467" @ 5 digit precision. Ask when moving rooms containing No Net/Locked Objects - With this option checked, a confirmation dialog will pop up when attempting to move rooms without Net/Locked Objects. The Model Search Paths button opens the Model Search Path dialog. The main body of the dialog lists the current STEP model file search path(s), which includes the default folders that will be included when linking 3D STEP model files via the 3D Body dialog. You could consider these folders 'watched' in that the software monitors changes to STEP files (*.stp, *.step) they contain. Click in the path field to browse for a suitable folder via the Browse for Folder dialog, the add it to the model search path list using the Add button. Whenever a STEP model is linked to a component footprint or PCB document, the folders listed in the Model Search Path dialog list are defaulted to. The concept of using common or central depositories for STEP model files can be beneficial, particularly in multi-user environments. Add - Click to add the folder currently displayed in the browse bar to the model search path list. Delete - Click to remove the currently selected folder from the model search path list. Mesh data is calculated for display purposes when a 3D model is first used or created. This data is saved and reused whenever that model is required. Storing mesh data in this way can improve system performance when working in the 3D workspace. Directory - Click to browse for a folder, via the Browse for Folder dialog, in which software will store 3D model mesh data. Time to Keep Unused Mesh Data- Click to view and select a maximum period of time (in days) for the system to store 3D model mesh data since its last use, before it is automatically deleted. Clean Directory - Click to immediately empty the folder used to store temporary 3D model mesh data.